The online stylist service Stitch Fix is a dramatic example of how to personalize customer service. Members fill out a survey and receive boxes of clothes and accessories that are curated to meet their individual tastes. This level of personalization is what consumers expect from your company’s marketing efforts. However, most potential customers aren’t willing to give you the amount of personal information required to pull off this kind of magic. Even though an overwhelming 94% of the organizations that participated in a survey conducted by Forbes and PricewaterhouseCoopers said personalization is vital to reaching customers, the efforts of many companies are falling flat. In a 2016 study by Forrester Consulting, only 18% of customers reported being “very satisfied” with companies’ ability to create personalized marketing messages. There are ways to personalize your marketing content without asking your audience to fill out a lengthy form. A few strategies will help you design marketing content that fits your customers like a glove. Developing personas requires that your marketing team members imagine themselves speaking directly to a specific customer. Surveying, or interviewing, current customers is one way to get information for defining a persona. However, you can also research data gathered from past customer interactions. A persona is a sketch of an ideal customer that gives you an idea of how to target your marketing content toward his or her needs. When developing a persona, consider a typical customer’s role, goals, challenges, sources of information, and common objections. Whenever potential customers interact with your brand, they leave clues about themselves. These interactions could take place through your website, social media, or long-form content, such as white papers or eBooks. The data that customers leave behind can then be mined for insights to discover what they want from your brand. Predictive analytics and machine learning are 2 ways of gaining value from customer data. Predictive analytics uses customer histories to forecast future behaviors so you can be proactive about meeting your audience’s needs. According to the beforementioned Forrester study, 42% of companies use predictive analytics to better understand customers through data. Machine learning is a great way to understand behavioral and attitudinal data. Social media is a gauge of customer sentiment, but the posts include unstructured data that is difficult to decipher. Unlike predictive analytics, machine learning can understand the associations between conversation threads and develop hypotheses based on them. Machine learning has tons of untapped potential. According to a Digiday Research survey, 72% of marketers fail to use machine learning to personalize customer experiences. Analytics can be used to better understand, reach, and speak to a targeted audience through segmentation and attribution. Because understanding and meeting the individual needs of your target audience can be a difficult endeavor, it is recommended, instead, to get to know smaller groups of customers. Segmentation is the process of grouping customers together according to similar demographics and psychographic attributes. Once you learn about these groups, you can focus your content to meet their needs and expectations. Attribution is a way of understanding how your customers prefer to interact with your brand. Certain channels may be more instrumental in converting leads into customers than others. Once you have determined which channels play a supporting role and which play a leading role in closing a sale, you can design appropriate content for these channels. Personalizing your marketing content is the key to profitability for your business. Gartner predicted that by 2018, companies that have invested in personalization will outsell those that haven’t by 20%. In the same study, 43% of potential customers said a personalized offer would positively influence their purchasing decision. Personalizing your marketing content requires finesse. TSL Marketing has almost 20 years’ experience helping companies in the tech industry make the most of their marketing efforts. Our strategists and production team will work closely with your company to design marketing content that speaks directly to your audience. Get more expert insights on how to develop winning marketing content. 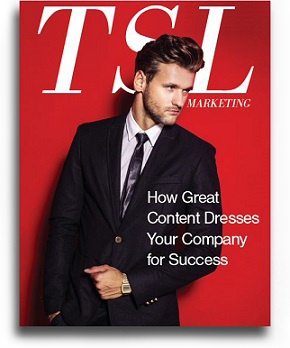 Read our eBook How Great Content Dresses Your Company for Success.